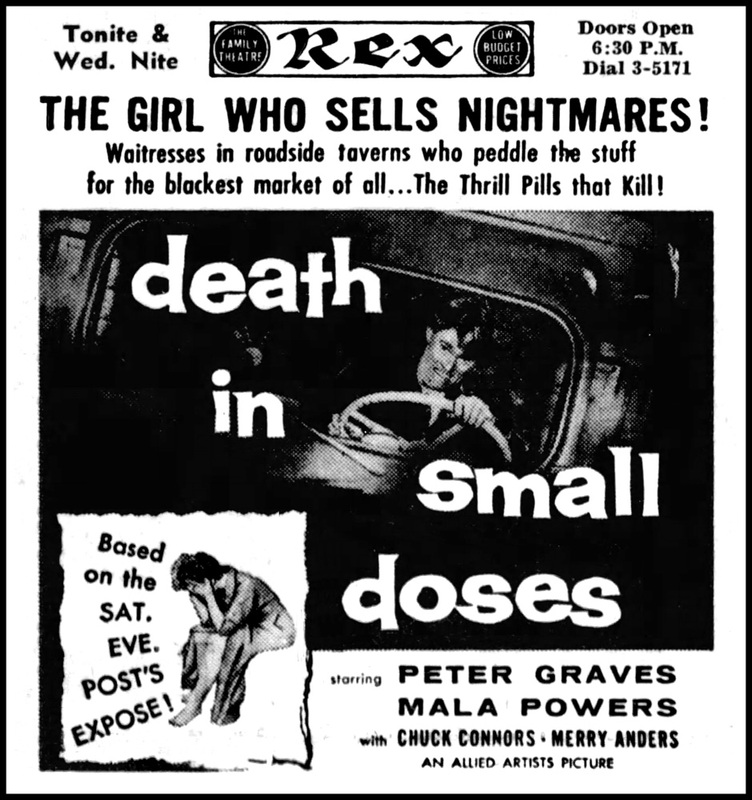 DEATH IN SMALL DOSES (1957; Just for the Hell of It). Only seconds into this speed-popping B-movie, you know you're in for a wild, hilariously goofy ride, as a jittery truck driver (one hand on the wheel, the other pouring pills down his throat) starts hallucinating about oncoming headlights, and finally careens off a cliff. Whoops! Adapted fron a Saturday Evening Post article by screenwriter John McGreevey (THE BEAST OF BUDAPEST) and directed by Joseph M. Newman (THIS ISLAND EARTH, THE GEORGE RAFT STORY), this b&w expose could be retitled THEY SPEED BY NIGHT, and feels exactly like one of those outlandish '50s teen anti-drug pics -- but without the teens. 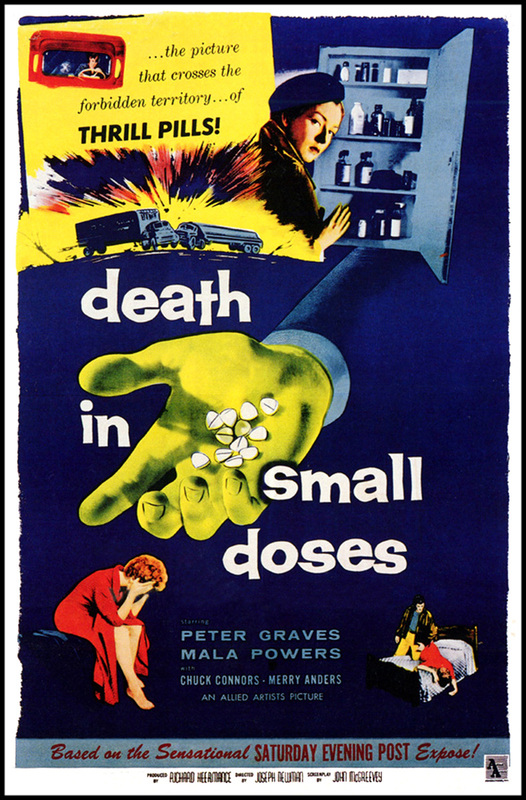 A pre-MISSION: IMPOSSIBLE Peter Graves is supposed to be the hero of this yarn, but it's difficult to get worked up about a FDA investigator, trying to dam the yearly flow of "900 million happy pills." And it seems like every long-haul trucker is popping these bootleg "bennies," since you've got to have a "co-pilot." Going undercover as a student trucker, on his first day, he witnesses one old-timer freaking out with a freight hook and then suddenly keeling over dead. Meanwhile, Graves' trucker-partner is a genial old gent who talks about wanting a long life -- so you know he's dead meat the moment he begins investigating the source of this illegit speed supply. Boy, does that make Graves mad (notice the furrowed brow), but not mad enough to forget about hitting on a comely widow (MAN ON THE PROWL's Mala Powers) who runs a flophouse for truckers. All of this drama is fine, but the true scene-stealer is a pre-RIFLEMAN Chuck Connors as Mink Reynolds, an amphetamine-addicted joker who lives (and man, does he live) down the hall from Graves. A cross between Neal Cassady and Jethro Bodine, this beat bozo energizes every scene and makes the film a must-see. For one run, the dude shows up in a Hawaiian shirt, with a convertible overflowing with cuties -- then proceeds to run cars off the road, on his way to a Massive, 18-Wheel Freak-Out. Demonstrating the over-the-top schlock sensibilities Connors would later bring to pics like TOURIST TRAP, this is the archetype of the screwed-up, over-the-top performance that would become a staple of late-1960s drug cinema. He's amazing! Do-gooder Graves, on the other hand, is Wonder Bread squeezed into the shape of a man. 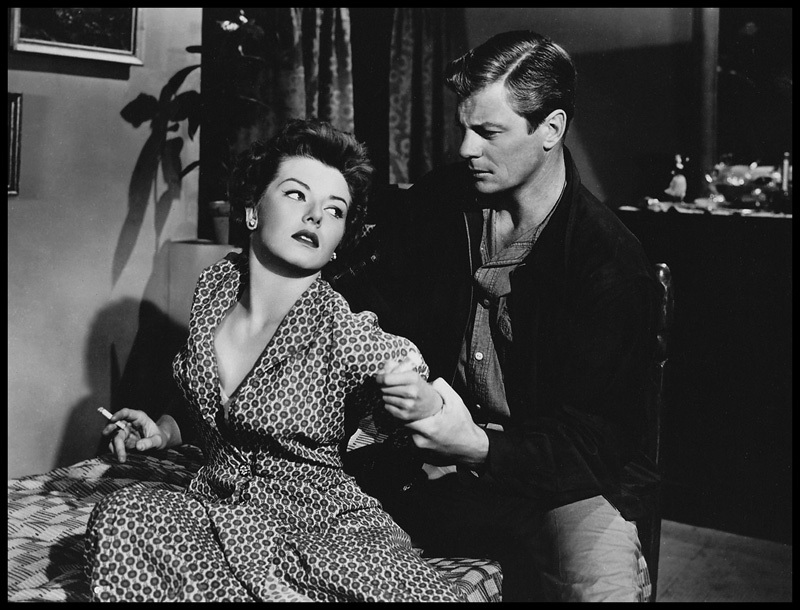 This Dexie-drama also gets points for capturing a believable blue-collar world of loading docks, gas stations and diners, but its best moments are left to the overwrought antics of Connors and his junkie Teamster pals. © 1998 by Steven Puchalski.